For years, I'd been hearing about a fruit that was so offensive to the olfactory sense, that in some countries, it's against the law to consume it in public, or even carry it on public transportation. Trouble is, until recently, I never had a clue where I could find any. In the past two years, I've seen many a travel show have a segment or two on the Durian fruit. Andrew Zimmern tried it in three separate episodes, and could never finish more than one or two bites. Here's one of his experiences. Anthony Bourdain on the other hand, slops it up like the best stinky cheeses. If two of my favorite food show hosts had such disparate views on it, which side of the coin would I fall on? First was my quest to find a purveyor. Luckily, the DC area is chock full of Asian markets that sell all sorts of durian comestibles: Fresh, frozen, durian juice, durian ice cream, durian Popsicles, etc. I thought my best bet would be just to go with durian au naturale. On my way home from the market, I quickly realized that there was no way my wife was going to let me eat this thing in the house. Even in it's partially frozen state, it still stank to high heaven! Think rotten egg, onion and vanilla pudding all mixed up in a big ol' bucket. That's durian aroma for you. Properly rested and prepared for my culinary journey, I grabbed my trusty cleaver and walked out to meet my new friend. Now thoroughly thawed, I could tell that I was a very very lucky man to have kept it outside as opposed to in the house overnight. Even with the breeze, the smell permeated everything. It's unmistakable, and unavoidable. And it only gets stronger when you cut into it. As you open it, you do get a bit more of a sweet scent, which makes it a bit more tolerable, but still not a scent that most Americans equate with anything other than spoilage. Something similar to old pumpkin. You know, the smell you get about a week after Halloween, when your carved pumpkins start to get a bit gamey? I'd heard from several sources that durian is best eaten with your nose plugged, as the smell and taste aren't necessarily linked. I'd beg to differ. The taste itself is odd. Not totally off-putting, but not totally enjoyable either. It's a combination of custard, papaya, celery, squash, and shallots. The sweetness is what you first taste, then you get the shallot/light sweet onion flavor in the back of the mouth. It's something that brings two distinct emotions, one of wanting to gag, but one wanting to have more. You have to keep reminding yourself that the oniony flavor isn't due to rotting, or going bad, it's just the natural flavor. The texture is probably the strangest part. The only way to describe it is like very hard scrambled eggs, with a bit of the membraney/stringy type texture of overripe mango. It's tough to get used to. I think the hardest thing to deal with is the 'recurrences'. 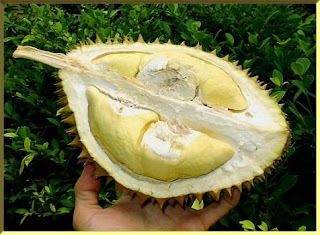 Durian seems to fester in your stomach, creating a lot of gasses that you regurgitate for the next several hours, which taste and smell just as strongly as the actual fruit. Definitely keep stocks of breathmints and Beano. Overall, it's not bad, but you definitely have to have an open mind when you attack it. It's something that, at first taste, I wasn't very fond of, but becomes an acquired taste. Now, I can eat them without a problem. But, as Anthony Bourdain said, durian is definitely best eaten alone. You are a brave, brave individual. Kudos, indeed! I admit I got a good chuckle from Andrew Zimmern's eating(s) of durian, though I'm bummed I'd missed the Bourdain durian tasting the first time 'round! For some odd reason, the links have since disappeared. I'll try to put them back up again. This is the # 1 search result for absinthe and durian. A cocktail I am considering for my trip to S.E. Asia next month. Since the locals say that durian should not be mixed with any alcohol, I may have to do it alone! "Smells like hell, tastes like heaven."